I’ve been a fan of Vertigo Crime‘s gritty noir graphic novels. A Sickness In The Family is the latest entry to the pretty impressive collection of comics. 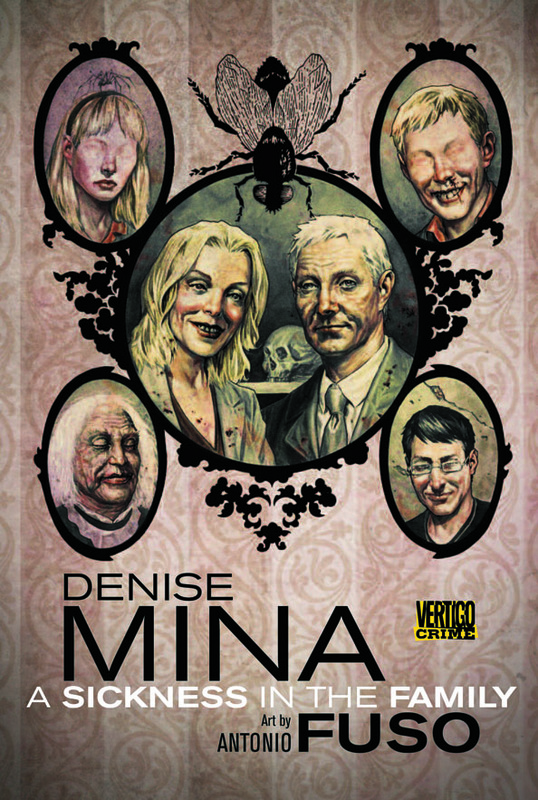 Written by Denise Mina with art from Antonio Fuso, the story has a very Agatha Christie feel to it and follows a family break down in a house that may be haunted. Meet the Ushers. The parents, Ted and Biddy, Grandma Martha. The three kids, William, Amy and Sam. Just a normal family gathered around the dinner table. Until they start dying. One by one. Each of most decidedly unnatural causes. Is there a curse on their house, as a recently unearthed history of witchcraft in the area would suggest? Or has one of the Ushers declared open season on the rest? As shameful secrets and bitter resentments boil to the surface, it becomes clear that more than one Usher harbors a motive for killing off the others. But in the end, the truth turns out to be far more shocking than anyone in this ill-fated family could have imagined. The story feels very familiar, but that’s not a bad thing. There’s twists and turns and I was guessing what really was going on until the very end. And that’s a huge compliment to Mina’s writing ability. The story is written in a mix of the events unfolding and flashbacks. Not the easiest thing to pull off without tipping your hat as to how the story ends. But again, I read and read and didn’t figure it out to the end. The art by Fusa is fantastic, top notch throughout the whole comic with each player being very unique and easily distinguishable. This is a spooky psychological thriller and one I absolutely recommend. Vertigo Crime has quickly become synonymous with quality and this graphic novel is no exception. Vampire Comics provided Graphic Policy with an advance copy of this issue for FREE for review.